If there's one thing that is true about playing guitar, it's that the sooner you start the better. Any child, as long as it is physically capable of holding a guitar can start learning how to play it. 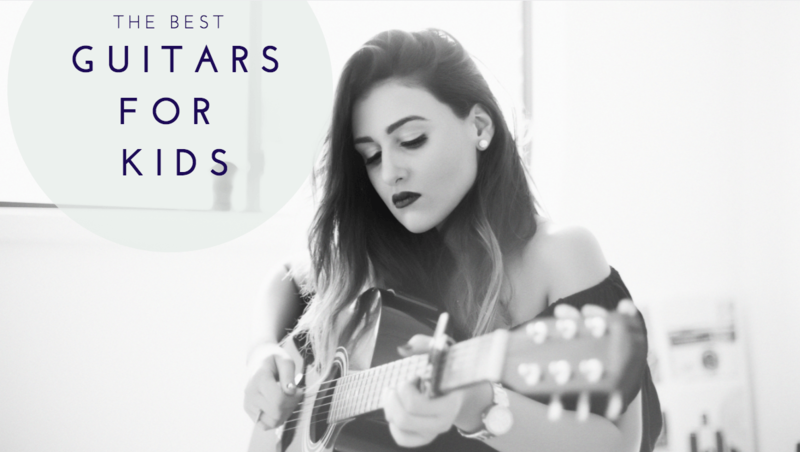 Since not all guitars are usable for this purpose, we are going to show you the best guitars for kids that were designed with the youngest generation in mind. Getting a guitar for your child is not as easy as it seems. You need to figure out a couple of things before both of you make agree on a model. We are going to run you through the most important aspects so that you can make the best decision possible. Depending on how big your kid is, acoustic guitars may or may not be an option. Sure, they make smaller acoustic guitars but even those can be difficult for a child to handle properly. Soundboxes are uncomfortable and often hard to get used to even for adults, let alone kids. Electric guitars, even though they are more complex, are a better choice. Slim body combined with a nice slim neck are the key here. With how cheap some practice amps are, you should have too much trouble finding a suitable model. Full Size or 3/4 Scale? In all honesty, for the majority of the kids out there, without knowing their size, we’d have to go with 3/4 size. It’s simply a safer choice. Comfort is an extremely important factor when learning how to play guitar, especially since we are talking about kids here. A 3/4 scale guitar is slightly smaller but still offers the same functionality and most of the performance as its full sized counterpart. On the other hand, if your kid is big enough to comfortably use a full sized electric guitar, that is what you should go with. Figuring out a budget﻿ for your kid’s first guitar is something that is purely dependent on your abilities and your kid’s interest in the subject. If you know that they will pursuit playing guitar in the long run, investing in a better full sized model is a good way to start. That is if they can handle the size. The other side of the coil comes in form of going for an affordable starter model. These have many benefits, most important being their expendable nature. If you take this path, you won’t have to worry too much if the kid bumps the guitar accidentally or if anything happens to it. Again, this is something that depends solely on you and your child. Finally, just remember that you should always make sure that the guitar you end up getting is one that your kid wants to play. In other words, they need to like the model. Being excited about a guitar is the best way to keep them coming back to it day after day. Not only that, you getting them that guitar will be a memory they will cherish forever. Aside from being inspired by one of the best electric guitars ever made, Squier’s Mini Strat is a force to be reckoned with. The guitar is designed and manufactured with a solid build quality. The performance is standard Squier stuff, which means decent tone and great playability. Out of all the 3/4 models out there, this definitely takes the first spot. Ibanez rendition of a micro guitar comes in form of GRGM21. Available in several finishes, this thing is the perfect starter ax for those little metal heads. Best thing about this GRG is that it brings pretty much the same performance and experience as its full sized cousin. Everything is built tight, the neck is smooth and fast. Overall this guitar gives you the best aesthetic value on top of already proven performance. SX is one of those brands who are pretty much specialized in short scale guitars. 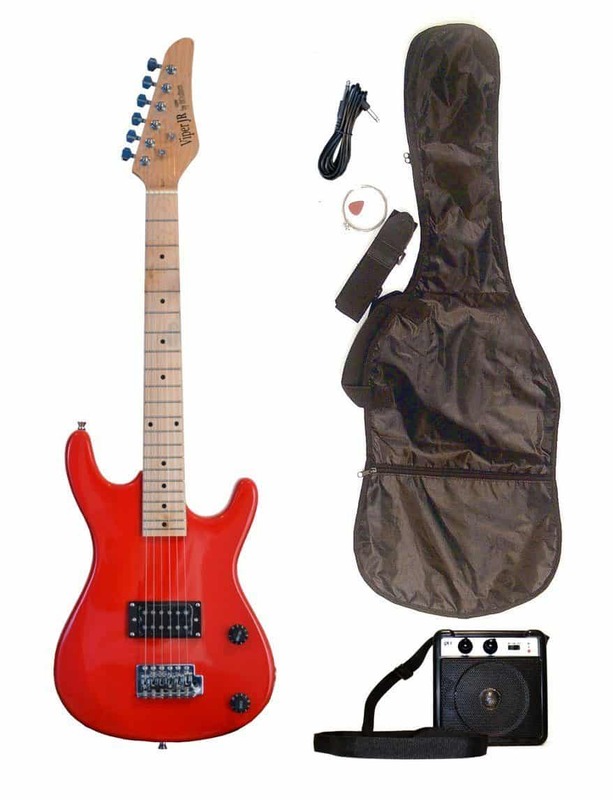 This starter pack comes with a decent Fender Stratocaster copy, their small practice amp, a gig bag and more. When put against the Squier, SX falls behind in a variety of areas but the price difference makes it an obvious choice for those on a tight budget. Speaking of affordable short scale guitars, here’s the ultimate budget choice. RED Junior Kid’s guitar features a Super Strat body shape closer to the Ibanez we’ve mentioned earlier. Unlike that Ibanez, RED Junior comes with a single pickup. However, it does come with an amp, a gig bag and a few other accessories that make it ready for use. Last but not least, let’s switch things up a bit and include one acoustic guitar into the mix. You’re looking at Fender’s MA-1 3/4 size guitar. It is affordable, built like a tank and offers a pretty decent sound. This acoustic features a pretty solid choice of tonewood for an affordable model, and the tone is simply amazing for the money. Since it’s a travel guitar, meaning that it’s smaller than your standard sized acoustic guitar, it should be comfortable even for smaller kids. If acoustic is the only way you want to go, this Fender deserves a couple of minutes of your time. The most important thing that you need to ensure is that your kid is happy with the guitar they get. Even if that means sacrificing some specs. We’ve shown you what we think are the best guitars for kids on the market right now. If you follow our advice, you should be able to make a well informed decision and set your kid up for success. These guitars are all more or less affordable, so they should fit just about any budget.